Doctor recommended to eliminate prostate and genital pressure! Purchase the optional Sheepskin Covers with your Easy Seat and save. NEW! Upgrade to the new Easy Seat Deluxe! Purchase the optional Sheepskin Covers with your Easy Seat and save! to help ELIMINATE prostate and genital pressure. Add the optional genuine Sheepskin Covers for extra comfort. Adjustable width for your Derriair! Adjusts from 8-3/4" wide up to 10-1/4" wide! The EASY SEAT has always been more comfortable than any other seat. But the new edition is even more stable. The individual pads flex with each movement. Pads 4-1/4" x 7"
Improved contour for better support, and a unique padding configuration to eliminate rubbing. The body is supported where needed most. This unique design eliminates the center horn completely which is the cause of discomfort in many conventional saddles. The two individual cups support and protect the pressure points of the body alleviating chaffing, pain and numbness. The Easy Seat is a unique seat. It may take time to adjust to the firm dual flexing pads. Try it for a couple of weeks and see. NEW! - Luxury Sheepskin Covers - Made in USA. 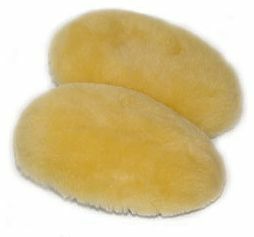 New Softer, fluffier and highest quality sheepskin covers. 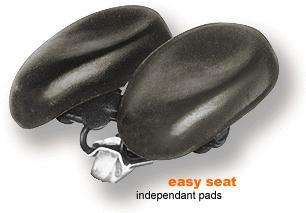 Purchase with an EasySeat and save. Exclusive! 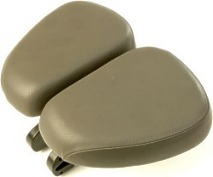 - Gel & Lycra Padded Seat Covers - The comfort of 1" of gel and the durability of lycra. Locking drawstring for snug fit and easy removal. There are recent concerns about Americans getting enough exercise. Did you know that riding a bicycle is a low impact exercise with great cardio-vascular benefits? Our bicycle seats help relieve pain and numbness allowing you to get more exercise, more comfortably. Please see the growing list of information concerning these issues for men and women.